Home » Mattress Reviews » Saatva Mattress Review: Is a Saatva a Good Mattress? Saatva Mattress Review: Is a Saatva a Good Mattress? Saatva is an online retailer shipping innerspring mattresses directly to the consumer. 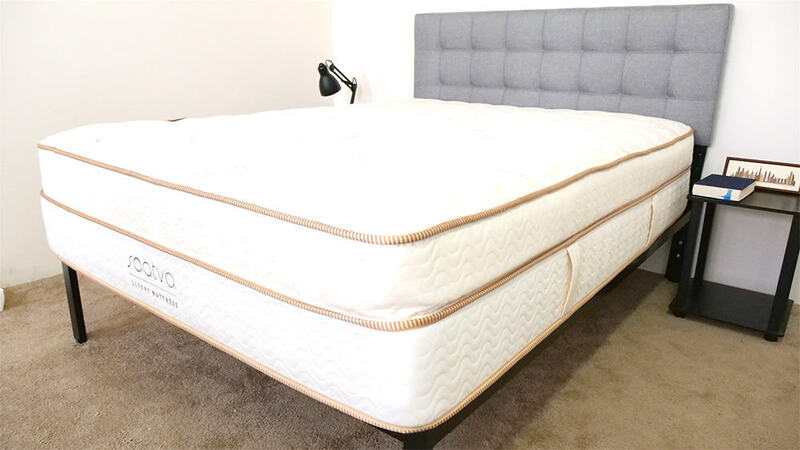 The Saatva mattress comes in three firmness levels, and for this review, I take a look at their Luxury Firm version, which is the medium firmness option. The Saatva is a good mattress for those who want support, bounce, and a quilted cover. Interested in learning more about the Saatva? Read on for my full review! If you’re in a hurry, you can click here to read my review summary! Saatva started in 2010 and has grown to be one of the biggest online only mattress retailers available on the market. Saatva was one of the first online innerspring mattress retailers to offer multiple mattress types to appeal to different sleeping preferences. 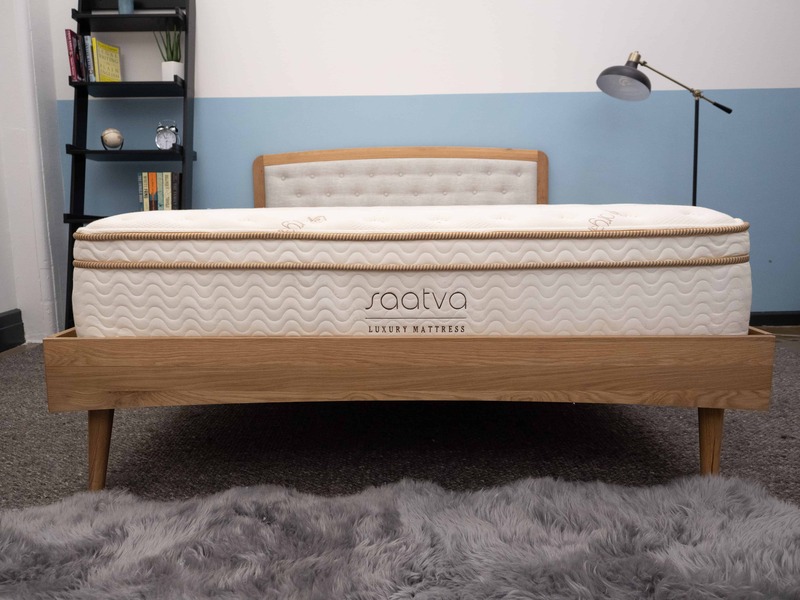 The Saatva is a traditional innerspring mattress, but the company also sells memory foam mattresses under the brand Loom & Leaf and latex mattresses under the brand Zenhaven. Saatva mattress construction consists of a cotton cover, layers of foam, edge support, and individually wrapped coils. Before getting too far into what makes up a Saatva, I should mention that the mattress comes in a Premier Luxury version, which is 14.5 inches tall, and a Custom Slim version, which stands 11.5 inches tall. For this review, I took a look at the 14.5-inch version, but both of these models are designed to have the same feeling and firmness level; however, only the 11.5-inch version is compatible with an adjustable base. Made from 100% organic cotton, the cover is soft and breathable, I found. The cover is also quilted with foam to create a Euro-style pillow top, connected directly into the top, on the mattress. This is going to give the mattress some softness and pressure relief when you first lie down. I should also note that the quilting on the Saatva cover is a bit tighter in the lumbar region. This coincides with an added strip of memory foam in the mattress that is meant to provide added pressure relief where it is needed most. Beneath the quilted cover is a convoluted layer of foam that provides some additional pressure relief. The convoluted design allows for airflow through the layer to help with cooling. This layer also provides a transition from the soft pillow top above to the coils below. This coil layer provides some initial support to the sleeper as well as some bounce to the mattress, so you won’t feel stuck while adjusting your position. Individually wrapped coils are also known for being good for isolating motion, which we’ll take a closer look at later in the review. This layer is made of steel coils and is meant to support the layers above as well as the sleeper on top. 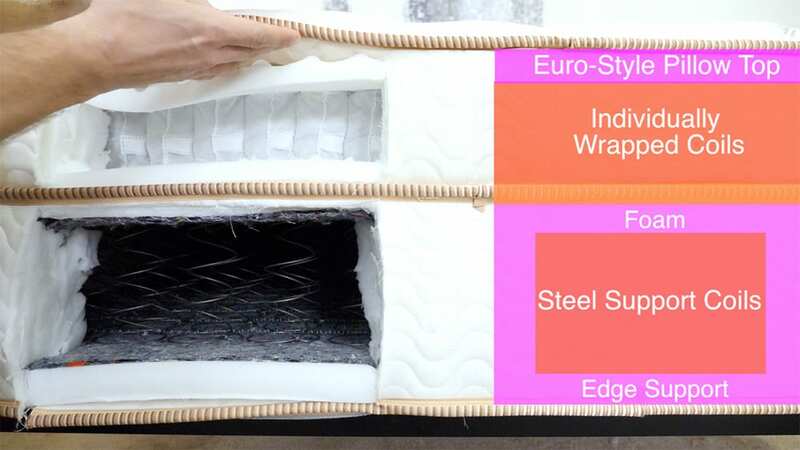 The tall coil layer seen here creates a lot of space in the mattress, which helps to improve airflow for cooling. Combined with the individually wrapped coils, the support layer creates a coil-on-coil structure, which will make the mattress responsive to pressure and give it some bounce. The base of the mattress is made of high-density poly foam and acts as the foundation of the mattress, and it’s what the coil support layer rests on. The high-density poly foam also wraps around the coil layer to create an edge support system. This foam is meant to help the Saatva keep its shape when pressure is applied near the side of the bed, and we’ll test to see how it performs later in the review. When I first press into the Saatva, I get the soft feel of the Euro-style pillow top. This soft feeling is quickly followed by the quick response of the coils below, which provide some good bounce. Love that innerspring feel? Check out my best innerspring picks. Everyone feels the firmness of a mattress a bit differently due to differences in body type and weight distribution. Instead of just giving my opinion on the overall firmness level of the Saatva, I brought in three other people to give their opinion as well. This should give you a better idea of the firmness range you can expect from the mattress. The testers were pretty much in line on the firmness of the Saatva, with three 7/10 ratings and a single 7.5/10 on the firmness scale. Generally speaking, 6.5/10 is thought of as a medium firmness, so we found the Saatva to be in the medium range but a little toward the firmer side. The first thing I noticed when I got on the mattress is the bounce that the coil-on-coil system provides. 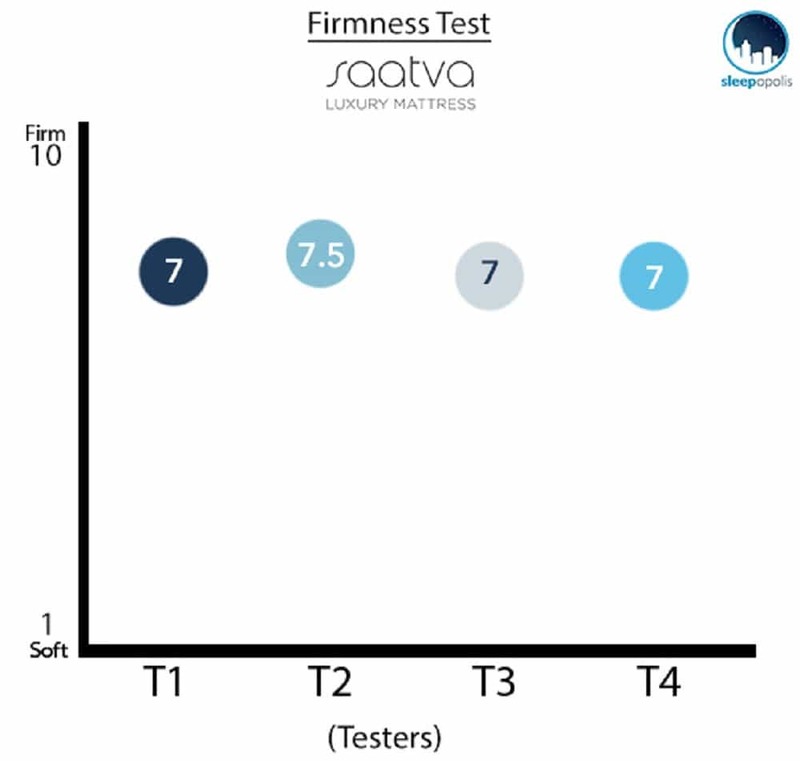 I personally rated the Saatva at a 7/10 on the firmness scale and found that I was pretty comfortable in a few different sleeping positions and felt that the Saatva provided a good mixture of pressure relief and support. This medium firmness should appeal to a wide range of sleeping styles, but I would like to reiterate that this mattress does come in softer and firmer versions, if you have more specific sleeping needs. Like a firm mattress? Check out my best firm mattress options. Instead of just describing the feel of the Saatva, I wanted to give a visual representation of where someone may feel pressure points while lying on a Saatva. To do this, I placed a pressure map on top of the mattress and lay on my back, side, and stomach. On the image below, pressure will be represented from blue (low pressure) to red (high pressure). While lying on my back, my weight is evenly distributed and the pressure map shows low pressure across my entire body. There was a different feel in the zoned lumbar area on the mattress, and the pressure map shows that it kept the pressure low in that region, which is great for back sleepers. The coil layers provided good support, and even though the quilted cover allowed me to sink into the mattress a bit, I definitely felt that I was more on top of the Saatva than in it. 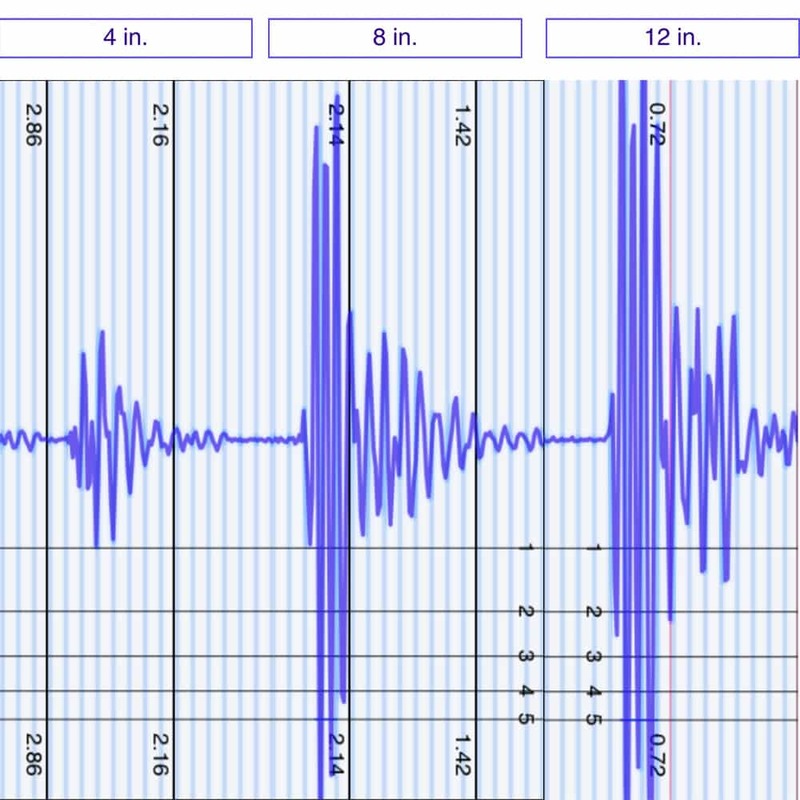 Once I rolled onto my side, the map shows a slight rise in the pressure levels across my body, which is to be expected, as it is a higher weight concentration on a smaller surface area. In this position, I could feel the individually wrapped coils contour to my body a bit. I personally didn’t feel pressure points forming at the hips or shoulders, two trouble areas for side sleepers, but I have a tendency to adjust my position while sleeping. If you are a strict side sleeper, you may find the softer version of the mattress more comfortable, as it will allow you to sink in a bit further for more pressure relief. Similarly to when I was on my back, my weight is pretty evenly distributed while on my stomach. 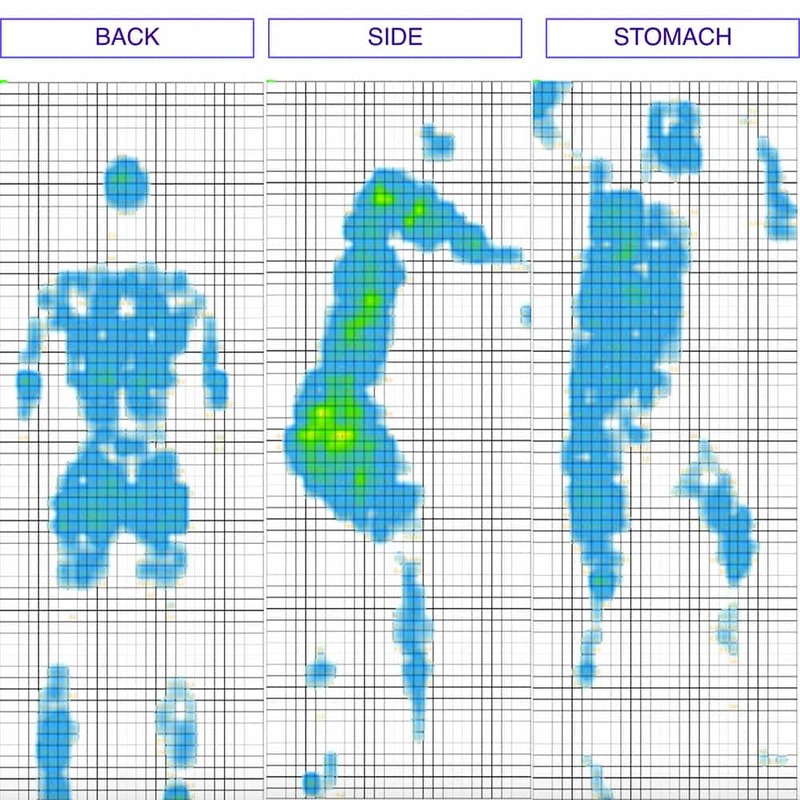 The pressure map shows low pressure across my chest, which allowed me to breathe easily while in this position. I felt that the coil support system did a good job of keeping my hips from sinking into the mattress, which is a concern for stomach sleepers, as it puts the back in a bad position. If you are a strict stomach sleeper or a bit heavier, you may find that the firmer version of the Saatva is a better fit for your needs. If you plan on sharing your bed with a partner, you will want to know what it will feel like when the other person gets into and out of bed or tosses and turns during the night. The next test in my review is helpful in showing the intensity of motion that is detectable from one side of the mattress to the other. As you can see from the image above, the 4-inch drop shows a small disturbance. This drop is meant to simulate someone tossing and turning on the other side of the bed, and the disturbance felt is pretty low. The foam pillow top of the comfort layer and individually wrapped coils are two components of the construction that are good at isolating motion transfer. As is to be expected, the 8-inch and 12-inch drops both show larger, very similar, disturbances. These drops interact more with the support layer of coils, which causes more motion transfer across the mattress. A lot of people buying a mattress will want to know whether they will have the feeling of lying on top of the mattress or sinking into it. In order to get a better idea of how much sinkage someone might experience when lying on the Saatva, I used four balls of varying sizes and densities (a 6-pound medicine ball, a 10-pound steel ball, a 50-pound medicine ball, and a 100-pound medicine ball) and placed them on the mattress to measure how much they compressed the surface. If you’re going to share your bed with a partner and need to use the entire surface area of the mattress, then edge support is something you are going to want to take a look at. Saatva specifically included a foam edge support component in this mattress, so I was interested to see if that paid off. Lying near the edge of the Saatva, I felt incredible support and saw no change from the center of the bed to the side. You can see from the image above that there was minimal compression of the top of the mattress in this position. I was also able to change positions without worrying that I would roll out of bed. There was very little change in support, even when I hung off the side of the bed a bit. Sitting up on the side of the bed (think putting your shoes on in the morning or getting into bed at night), my weight is entirely concentrated over one area of the mattress. You can see that the Saatva did a great job of supporting me in this position and kept its shape so well that my feet couldn’t touch the ground. This position may not be the most important when looking at a mattress, but it does a good job of showing what increased pressure can do to the side of a bed. Sleep Trial: Saatva offers a 120-night trial. Warranty: There is a 15 year warranty on the mattress. Convinced Saatva is the right mattress for you? Learn more at SaatvaMattress.com. *The Saatva comes in a Premier Luxury version, which is 14.5 inches tall, and a Custom Slim version, which stands 11.5 inches tall. Both styles are meant to have identical feels and firmnesses, and during testing, our testers found this to be accurate. Is the Saatva Mattress right for you? Now that we’ve taken a closer look at the Saatva, it’s time to discuss who I think it would be a good fit for. People who like a traditional innerspring feeling: The Saatva has the classic feeling of a coil mattress. 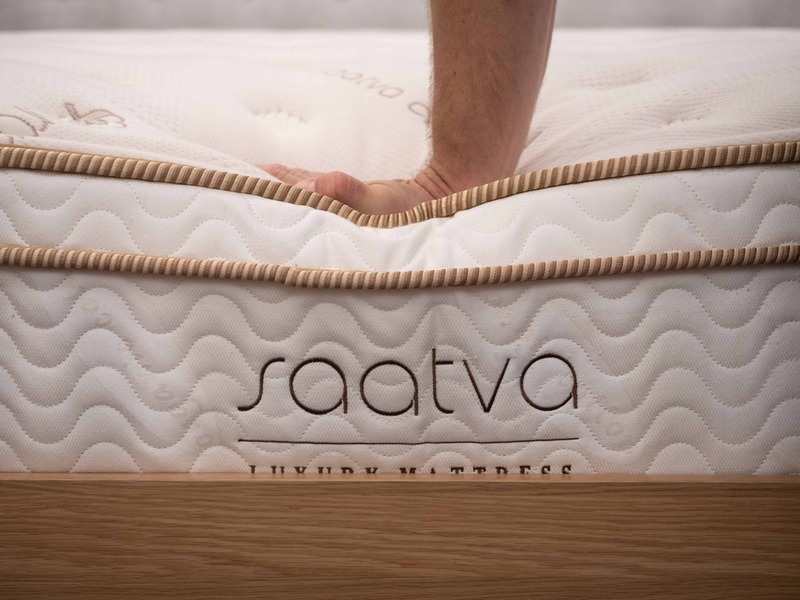 By combining the coil-on-coil structure with the quilted cover, Saatva has created a feeling akin to that of a mattress in a high-end hotel. Those who want good support and bounce: The coils on top have a quick response to pressure, allowing you to adjust position easily. Also, the coil-on-coil structure provides good support and helps keep your back in a good position regardless of how you sleep. 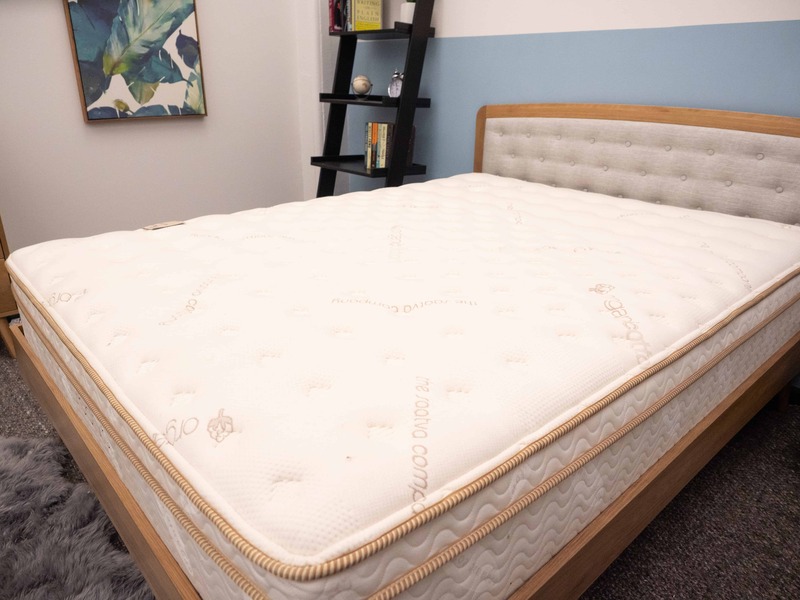 People who want to feel on top of the mattress: While the quilted cover does allow you to sink into the mattress a bit, the coil system does a good job of defending against the stuck feeling found in memory foam mattresses. For more information or if you’re ready to purchase, visit SaatvaMattress.com. Saatva’s coil-on-coil construction provides a classic innerspring mattress feel. The Saatva trends toward the bouncy side, which could make it a good option for combo sleepers, who roll around a bit at night, because you won’t feel “stuck” in the mattress. The Saatva comes in three different firmness levels so there is an option for you regardless of your preferred sleeping position. Both my husband and I suffer from pretty significant lower back & hip pain due to disc issues. Unfortunately, due to other injuries, I also have neck & shoulder issues. To complicate things further, I am a mainly a side sleeper, and get over-heated pretty quickly and he is a combo sleeper- back & side. Based on what I have read, a firmer mattress might be better. I have been reading reviews, and watching your videos. Any input will be greatly appreciated. I have been researching several mattresses, we like the Heavenly bed at the Westin Hotels, so we will be purchasing two of the Saatva Luxury firm mattresses, one for our room and one for our guest room. This mattress looks like what I need for my back issues. I need to stay on top and not sink in too much. just got a Saatva firm mattress 60+ day ago got a little indention forming where I sleep on my back and stomach not much problem about half inch if that is this normal for this type of mattress? did you find a mattress yet, same problem with back, did you buy Saatva? I have arthritis is my lower back, and am looking for a firm mattress. Sounds like Saatva is medium support? I presently have KIngsdown 400 Red series, about 4 yrs old. Have to sleep at edge of mattress to get the firm support I want.